hee hee i like it tt. Gromit sends thanks to Pottygardener and Maccrimmon. That's so funny.Why do they do that, its like sorry guys, I am here for a while so anyone else want's a drink - tough. As the wood pigeon went in, most of the water came out... I had to refill the bath completely. Lol. Brilliant photo TT .. well caught , very funny ... LOL ..
Bathtime is a time for indulgence. Looks like pidge has got it about right. Lovely pic. .....but Dp, let's hope Wallace isn't under the pigeon. Lol. Today the pigeon and a collared dove were having a confrontation on my back lawn. They seemed to be disagreeing over who was next in line to use the pool ..... Lol. Brilliant picture and caption, we are great fans of W&G, Like other GOY members it certainly put a smile on my face lol. That's a great photo, TT - looks like Pigeon is thinking of laying eggs, a sort of water birth!! There are blackbirds breeding in my clematis, and new rare breed chickens moved in next door, so maybe this was the only pigeon place left for bathing and birthing. Lol. LOL!!! Bruties favoutire bird! ... not!!!! He would not let a pigeon sit still long enough for me to take a picture!! I took the photo before Conker the Sheltie spotted the pigeon. Lol. Pigeon looked really indignant through the whole of it's bath-time ! Do you know if the feather colours are different in boy and girl woodpigeons for identification? .... or do we identify by the fact that the females spend a lot longer in the bath...? Lol. If it's any help, according to the book I have just looked in their colours are the same in woodpigeons. Let's hope the woodpigeons know which is which. Lol. How funny! We have rock doves here, have never seen one bathing, though. I'll have to speak to them about their personal hygene. 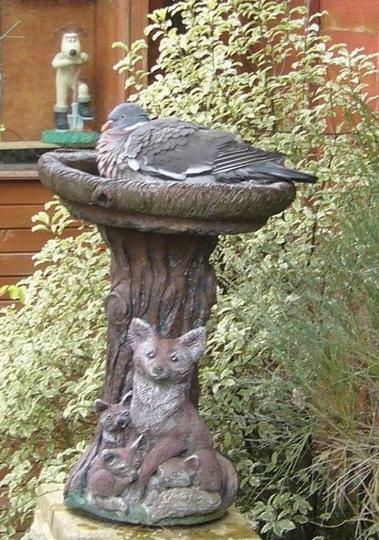 Foxy birdbath, cute! Do you have correct size pools for the rock doves over in Washington State ? Is their lack of hygiene due to wrong size bathing facilities ? Lol. In Canada, do you get to see all the Wallace and Gromit adventures? Sometimes we see them but I think only the same two or three ever seem to air. He/she's made themselves at home. Did you have to use a crowbar to get it out??Lol. Do you see Wallace and Gromit on American TV ? It must be a male pigeon Terratoonie, otherwise there would be scented candles and a glass of Chardonnay !!!! When the pigeon visits, she does stay in that little pool quite a while. I wonder whether next time she'll bring a book to read ... Lol. We really like this, especially for Gromit's expression/pose in the background! There was chat elsewhere about the "Curse of the Wererabbit", Arlene gave a detailed description of the exhibition, and you noted the marvellous veggies to be seen in the movie! He He He thats brill they are just so stupid !! ....he had to cool off his undercarriage before the flight home. LOL. 20th birthday for Wallace and Gromit ! ? Just watched the curse again, never fails to amuse!! Sweet family at the base of your birdbath. the fox family is still there, 7 years later !